In her own words, “As most families had back in the ‘50s, we owned a Brownie Hawkeye with the flash. We used it to take pictures of family and friends on special occasions. I took a few pictures of my friends, etc. but was not really that interested in photography. Then I went to college and don’t even remember having a camera. My journey really started when I lived on a small, Spanish-speaking island in the Caribbean between St Thomas, Virgin Islands and Fajardo, Puerto Rico. My then husband and I collected and exported marine tropical fish. In 1968 Nikonos came out with the Nikonos II underwater camera. On one of our trips to St Thomas, a duty-free island, we bought one, and that sparked a love of underwater photography. Everything was manual in those days – no auto focus! The film set the ISO and the photographer had to set the f–stop, speed and distance. Distance judgement underwater is sometimes tricky as the water deceives your eye. I used 35mm and 28mm lenses. After returning to the States, I finally bought a strobe and a 15mm lens, which became my favorite go-to lens. 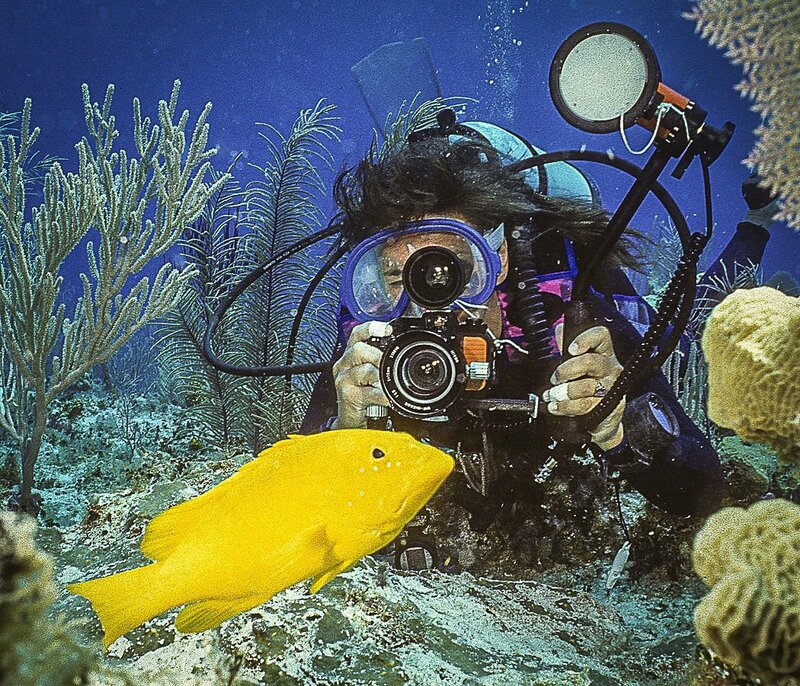 My photography passion remained underwater, and I was very fortunate to dive in many beautiful places in the world. Around 2008 I made a new friend who was a photographer and got interested in photographing on land. Armed with my Nikonos and a new digital point and shoot, we did some photographing together, and I joined the Los Gatos Camera Club. We had fabulous photographers in the Club, who were very generous in sharing their knowledge. The most valuable contribution to my education was the friendly competitions we had every month. To see the work of others, and have my own work judged was always inspirational and informative! Drop in to the photo studio any Wednesday or Friday morning from 9-12 in the Agate Room at HOA#2 to see what the Club can do for you.